Join us in Chamonix, France, for a week immersed in the world's most famous-trail-racing scene, the Ultra-Trail du Mont-Blanc®. Noted US ultra runners Krissy Moehl and Jeff Browning will lead this unique and memorable trip. $3,995 per person. Pricing assumes double occupancy. Single supplement cost of $900 per person. Three-star hotel in Chamonix, France, and Courmayeur, Italy; one night at French Alpine Club Albert Premiere hut with shared dorm accommodations; breakfasts and dinners (except dinner one night); Geneva-Chamonix, Chamonix-Courmayeur, Courmayeur-Chamonix and Chamonix-Geneva shared shuttles; Run the Alps' internationally certified guide; Chamonix and Courmayeur village materials, Run the Alps' Guide to Trail Running in the Alps and other supporting materials; trail snacks during daily runs. Are you thinking that you’d like to run one of the UTMB® races someday? Here’s an opportunity to check it out and experience some of the route. Maybe your name was in the lottery, but luck wasn’t with you? Now you can get a front row seat until your magic lottery day arrives! Or, perhaps, you simply love trail running – really love it – love the mountains, the sport’s characters and the history. In that case, experiencing Chamonix during the week of the six UTMB® races has to be on your list. UTMB® is the “Capitale Mondiale du Trail,” or the “World’s Trail Running Capital.” And during UTMB® week, the town is electric, with thousands of trail runners from around the world converging for the highlight of the year. We’ve coupled this great vibe with two of our favorite US trail runners who know UTMB inside and out– Krissy Moehl and Jeff Browning. Krissy has won UTMB® twice, including the memorable first edition in 2003, and then again in 2009. She now works as a running coach, writer and race director, while continuing to gain podiums – last year she came first in China’s Gaoligong by UTMB® race. Jeff has also stood on dozens of podiums in his nearly two decades of ultrarunning, including winning the Hardrock 100 last year. In 2017, he finished 20th in UTMB®. Jeff works as an endurance coach, and is also passionate voice for the conservation of wild places. Both Krissy and Jeff are Patagonia Ambassadors and experienced trail-running coaches. They have a wealth of trail-running tips, single-track secrets from around the Chamonix valley, and stories from years past to share with you. We’ll live the trail-running dream: running in beautiful places, eating amazing food, sharing the world stage race experience and collaborating with like-minded trail loving people. We’ll mix UTMB® events in town with trail runs throughout the area, such as La Jonction and the Bosson Glacier, the Mer de Glace glacier, or Chamonix’s dramatic Vertical Kilometer, complete with cables and ladders. Our group will run at an intermediate trail-running pace. You should have some experience running on steep and technical terrain. We’ll take our time, making stops en route to enjoy high Alp refuges, and learn new trail-running skills from Krissy and Jeff along the way. The Chamonix valley presents many opportunities for taking mountain transportation to the valley, if you find yourself “bonking” and need a shorter day. We intend to provide free time to explore, read and slip into your own vacation mode. If that means longer hours on the trails or taking a gondola down to get to a glass of wine sooner we look forward to helping make these days your best. Nights will be spent enjoying dinner at the many great restaurants in town, and taking in UTMB® events, including talks, athlete appearances, films and much more. Run the Alps is delighted to have been named a 2019 approved UTMB® training partner. Our partnership with the race allows us insights and opportunities for our guests that otherwise would be impossible. This is going to be one of the most memorable trips we’ve ever offered. We hope you can join us! Arrive Geneva, transport to Chamonix, France, via shared shuttle. Evening meeting and welcome dinner together in Chamonix. We’ll set off on a trail run to explore the trail-running paradise of the Chamonix valley, perhaps under Mont Blanc on the North Balcony to the Mer de Glace, or along part of the UTMB® route. In the evening, we’ll watch the finishers of the 145km TDS trail race run through town. Today we’ll explore the world of fast-packing, as we head up to the quiet hamlet of Le Tour, at the top of the Chamonix valley, and run along a stunning, high-elevation balcony trail from Col de Balme to the Refuge Albert Premier. We’ll spend the night at this modern mountain hut, at 8,865 feet elevation, overlooking the massive Glacier du Tour. Today’s race day! We’ll run back into town via the final miles of the UTMB®, along Chamonix’s iconic south balcony. We’ll take in the scene in town, then will be part of the incredible energy of the UTMB® start at 6pm. Around 8pm, we’ll cheer the first finisher of the 100km-long CCC trail race, as they sprint into Chamonix. We’ll finish this epic day with an evening shuttle through the Mont Blanc tunnel, to Courmayeur, Italy. Dinner will be on your own tonight, after the UTMB® start and before our evening shuttle through the Mont Blanc tunnel. Early morning, the top UTMB® racers will pass through Courmayeur. If you want to set an alarm, you can see the race as it plays out, cheering on the runners! After breakfast, we’ll have the option of a short trail run in Italy, before heading back to Chamonix to watch UTMB® winners cross the line in the early afternoon. We’ll enjoy a relaxed run on the trails around Chamonix, and then in the afternoon watch the last finishers of UTMB® – and the 330km PTL runners – as they high-five the cheering crowds in town. You’ll even have a chance to meet with some top UTMB® finishers and chat about their experiences! After trail running’s most famous week, we’ll take a day to wind down and explore one of the wilder runs in the area – perhaps up to the Bossons Glacier at La Jonction, or into the wild and quiet Aiguilles Rouges Natural Preserve. We’ll enjoy a final dinner together, sharing trail-running highlights from the week’s big races! Today, we’ll say our goodbyes, as we take leave of Chamonix and the UTMB® experience. 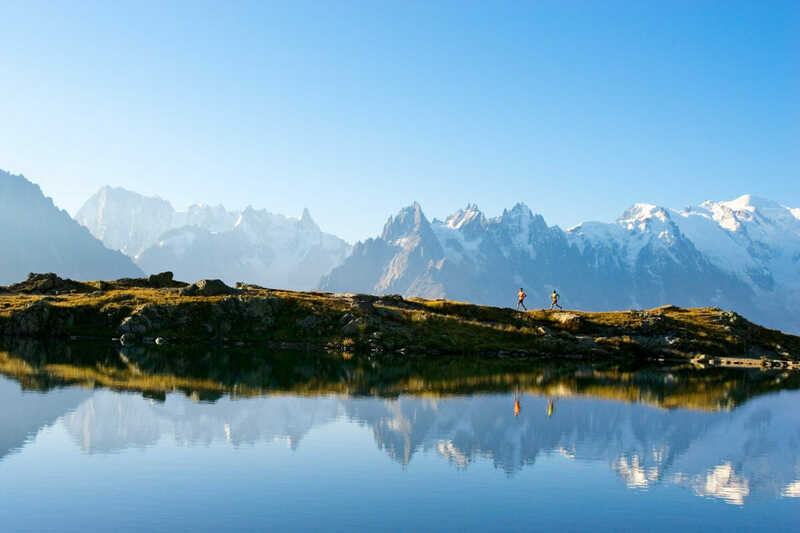 For those who wish to stay longer and see Chamonix in its quieter moments, Run the Alps is available to support additional planning and trail-running suggestions. We’ll have a shared group shuttle departing Geneva airport at 13:00 on August 27th. If you arrive earlier in the day, it’s possible to store luggage in airport lockers and take the train ten minutes into nearby Geneva to explore. If arriving outside the shared shuttle arrival window, you’ll need to book and pay for the shuttle directly, about $40US. Run the Alps can provide supporting materials to facilitate booking, if needed. for Geneva airport on September 3rd starting at 9:00am. Flights leaving Geneva at 1 pm or later are recommended. If you’d like to extend your visit with additional trail running, we can help with our self-guided run descriptions for various regions of the Alps, or other trail race options.